Bikepacking is best described as the union of mountain biking and backpacking. Compared to asphalt touring, bikepackers traditionally operate within the backcountry realm, carry lighter loads, and find solace in a more wholistic approach to two wheel travel…scouting our own routes, DIY gear projects, and taking part in underground events like the Tour Divide. Are you looking for any particular content? The most versatile option for any route is a 29er hardtail mountain bike. Using cyclocross or "gravel grinder" bikes are not unheard of on calmer forest service routes/races like the Alberta Rockies 700. It all depends on the terrain you will be predominantly riding. Suspension and wider tires are preferred for more challenging terrain. And of course, fat bikes with studded tires in the winter. Above all, we like to encourage new riders to use what they've got first. There is no bike snobbery among the bikepacking community. If looking to buy new, several major brands have come out with hybrid 'Adventure bikes'. These models are generally more accommodating for bikepacking bags (the middle frame area in particular), have extra water bottle mounts, and hold more of an upright position - better for long days in the saddle. At present, Salsa (out of the U.S.) is the only company that specifically targets the bikepacking community. Their Cutthroat bike was made especially for the Great Divide Mountain Bike Route. Canvas bags that affix directly to your frame via velcro straps have emerged as a lighter, more reliable way to carry gear on rougher terrain (and easily mount to any bike in minutes). With traditional panniers, there is concern for metal fatigue and unnecessary bulk; bikepackers emphasize a light and quick approach, restocking more often vs. carrying everything but the kitchen sink. Top tube bags - For smaller items that you need to access more often. A little bit of food, your cell phone, a multitool, etc. Whether you use a tent, tarp, sleeping bag, bivi sack, Therm-a-Rest, hammock, quilt or plan on motel-hopping, the right way to get your ZZZZs is truly a personal preference. And don't expect to nail it on round one! It takes a lot of practice to become comfortable sleeping out in the elements. It's always a good idea to have a few forms of navigation, just in case one fails. A hardcopy map (or directional cues), a GPS unit, and a combination of both saved to your smartphone is a solid plan. On the technology end, AA battery operated GPS units are the gold standard - you can buy batteries anywhere; Garmin's Etrex 20 & 30 units are preferred by many. More expensive, rechargeable units, they walk a thin line between greater functionality (beyond a simple breadcrumb trail and basemap) and being able to hold a charge. You ideally want a torch on your helmet and handlebars. In regards to the latter, we are the exclusive provider of dyanmo-powered kLite products. Made in Australia, these tiny units utilize the most powerful LEDs on the market and are the go-to for many top riders. Dynamo power has made a resurgence because of bikepackers. These hubs generate small amounts electricity to power lights and other gadgets. Shutter Precision (SP) and SON are the go-to for most. Which brand you go with will largely depend on your hub size, spoke count, and power needs. For secondary power, AA / AAA batteries and USB power banks are also recommended. How and when to use each of these sources will take a bit of practice. Every gadget has different power needs, recharge times, and potential restrictions, as in the case of current generation SPOT units, which can only use AAA lithium ion batteries (and are not easily sourced while on the road). More infomration in the Charging section. Many of our gadgets these days are powered by USB. Phones, headlamps, higher-end GPS units, to name a few. You can't just connect these direct to the dynamo hub, however. Sinewave Cycles has made it possible to convert this energy into a usable form. If using the kLite, we recommend the Sinewave Revolution charger. With a bit of soldering, it can be made plug-and-play ready with the kLite Simple Switch (that diverts power to either the light or charger). Making sure loved ones know where you are when you're not in cell range is great piece of mind. This is accomplished through satellite tracking with SPOT or InReach. Both have their pros and cons as far as functionality and cost. If you're just looking for basic tracking, an SOS button to notify emergency services, and the ability to send a few pre-programmed messages to family, SPOT is the more affordable option. InReach takes it a step further with weather reports, greater texting freedom, GPS functionality (cutting down on the need for an extra gadget), and more. In both cases, you will need to purchase the unit plus a monthly service plan. We also recommend getting the GEOS emergency extraction insurance. Without this coverage, you may be on the hook for any extraction costs. Carrying one of these units is required for events that utilize Trackleaders. 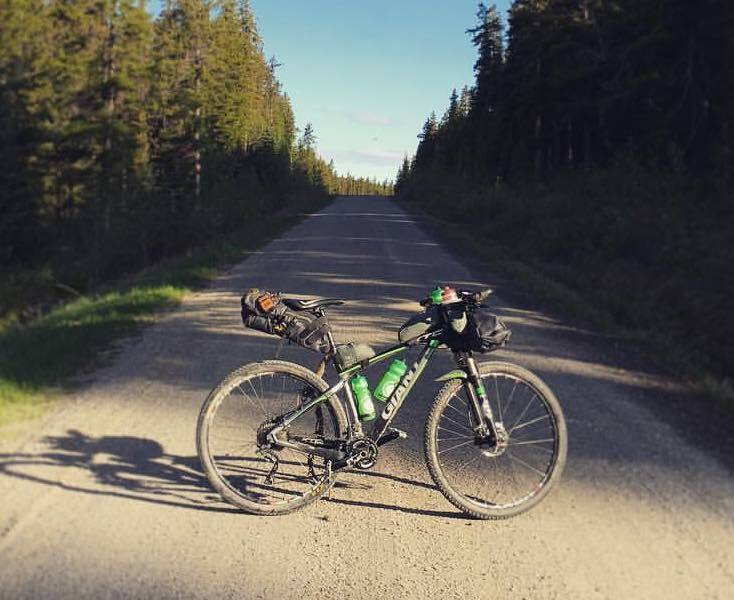 The typical bikepacker is generally able to carry 2-3 days worth of food. Store bought or ready to cook-on-the go, the choice is yours. Each has its pros and cons as far as convenience and nutritional value. When riding for multiple days at at a touring pace, the body depends on internal fat reserves and anywhere between 200 – 400 calories / hour of ingested carbohydrates. Electrolytes and water are also an important part of the equation. How much of each will depend on environmental conditions and your sweat rate. A good rule of thumb is to consume one water bottle an hour. If combing whole foods with more traditional sport nutrition products, make sure to check out Hammer Nutrition Canada. They offer a comprehensive line of fuels and are a great go-to for questions.